Watery eyes, congestion, sniffles, sneezes, sore throat, cough, headache…these are some of the symptoms of a common cold. A common cold is an infection of the upper respiratory tract, nose and throat. It is usually harmless, although it may not feel that way. The common cold usually catches up with us at one time or another. With children getting as many as eight colds per year or more. This contagious viral infection of the upper respiratory tract is the most common infectious disease in the United States and the number-one reason children visit the doctor and stay home from school. There are approximately 200 viruses that can cause a cold. Most colds are caused by rhinoviruses (the name comes from ìrhin,î the Greek word for nose) that are in invisible droplets in the air we breathe or on the things we touch. Aside from rhinoviruses, there are more than 100 subtypes that cause up to half of all colds. They can infiltrate the protective lining of the nose and throat, triggering an immune system reaction that can make throat sore, suffer headache, and experience difficulty to breathe through the nose. While getting a chill does not cause a cold, there are factors that make a person more susceptible to attack by cold viruses. These include excessive fatigue, depression, allergies involving nose and throat symptoms, and the middle phase of the menstrual cycle. A cold begins when one of several different kinds of cold virus attaches to the lining of the nose or throat. The immune system sends white blood cells out to attack this germ. Unless a person encountered it before, the initial attack fails and the body sends in reinforcements. The nose and throat get inflamed and produce lots of mucus. 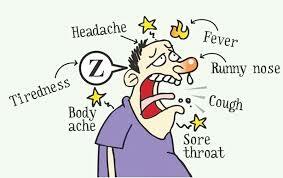 With so much of energy directed at fighting the virus, a person suffering from cold feel tired and miserable. The common cold is spread mostly by hand-to-hand contact. Like if a person with a cold blows or touches his or her nose, and then touches someone else’s, the person becomes infected with the virus as well. Then, the cold virus can live on objects such as pens, books, and coffee cups for several hours and can be acquired from such objects. While common sense would suggest that coughing and sneezing spread the common cold, these are actually very poor mechanisms for spreading a cold. Thereís still no cure for the common cold, however, there are plenty of cold symptom remedies. The major home impact that we can have on the common cold is hand washing. Hand washing has clearly been shown to prevent the spread of colds. This can be particularly effective in public places and is recommended before meals. While there is news about treating the common cold with Zinc, this is still not considered to be confirmed by adequate scientific research. Its benefits remain unproven. Vitamin C has been said to reduce the duration of symptoms from a common cold but medical research has not supported this. If symptoms of a common cold aren’t improving, it is always advisable to see a doctor to make sure one don’t have a complication of a bacterial infection in the lungs, sinuses or ears. The common cold is truly common, cause it is the most contagious infection one will encounter in his or her entire life.